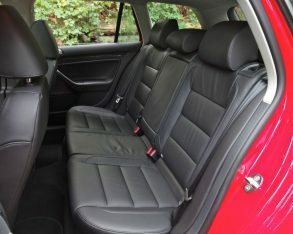 they’re awash in selection but starved of real choice. 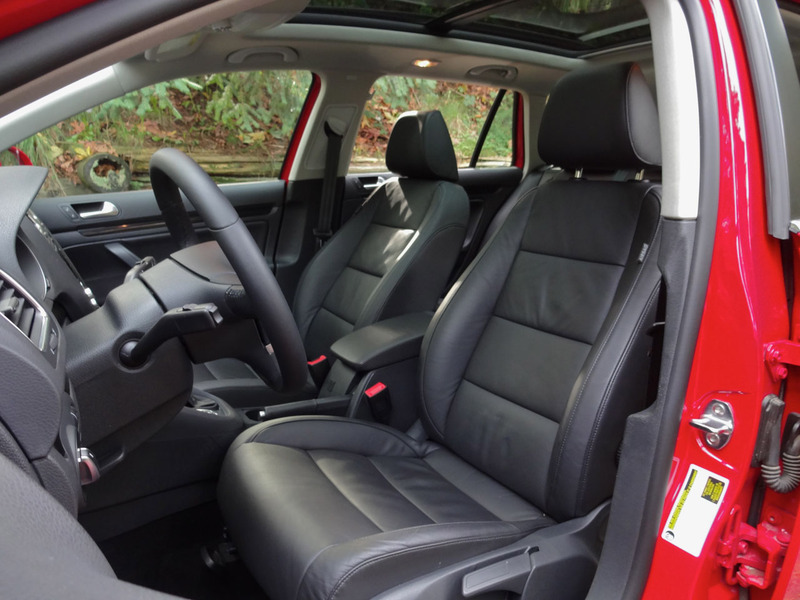 After all, what’s the real difference between a Toyota RAV4, a Honda CRV and a Hyundai Tucson? 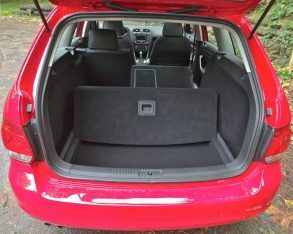 There is, however, one genuinely unique entry in the marketplace: a commodious carry-all that stands out by hunkering down low to the road and remaining the sole holdout in a once ubiquitous segment. 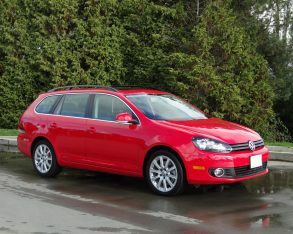 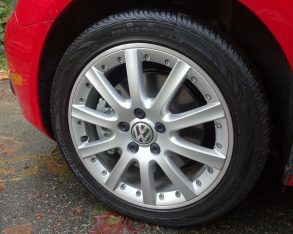 We’re talking about the family wagon segment, represented here by the Volkswagen Golf Wagon. to a hybrid but with a far greater fun factor thanks to abundant low-end torque. 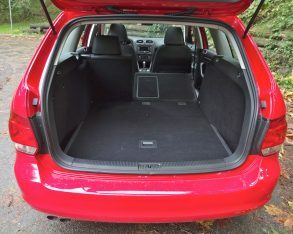 In Wolfsburg Edition trim, nicely loaded means the Golf Wagon comes with special 17-inch alloy wheels, leather upholstery, 10-speaker audio with satellite radio and navigation, a panoramic sunroof, keyless entry, a leather-wrapped steering wheel and gear knob, alloy pedals, dual-zone electronic climate control, fog lights, eight-way adjustable driver’s seat with power recline, and a few more things beside (this includes Wolfsburg badging that wasn’t actually installed on my test car, but which I later learned was likely hiding in the glovebox and would be installed by the dealer in a couple of minutes flat). 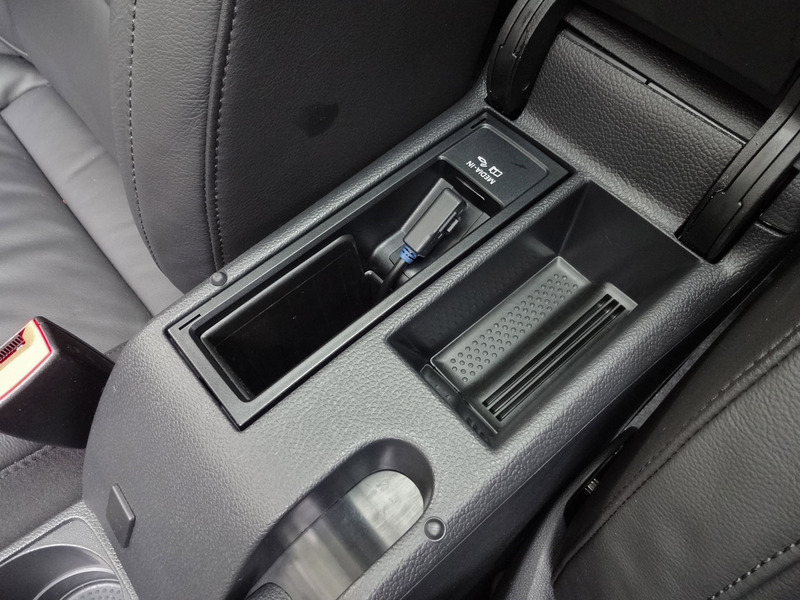 and no USB audio input, all of which one might expect in a compact car in this price range. 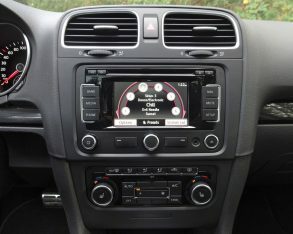 This said an auxiliary plug and iPod connector come standard, and that missing USB connector can be purchased from your local VW dealer for a small sum, but with more USB users (like me that prefers running my tunes off of an inexpensive USB thumb drive) than iPhone/iPod operators VW is missing the mark. I also found the touchscreen a little on the small side, which somewhat limits the usefulness of the navigation map, especially given the map’s rather chunky graphics. 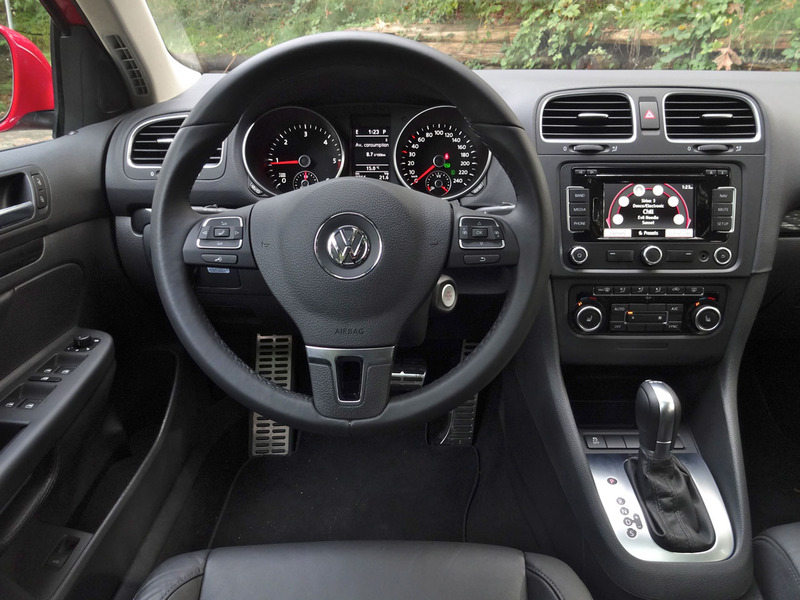 In a final nitpick, I found the row of blank switches ahead of the gearshift a little off-putting – it makes me wonder what equipment the car is missing. 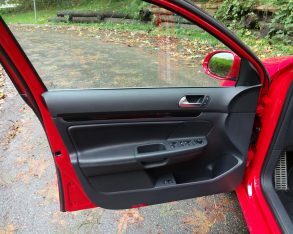 I drove recently improves things up front with soft-touch door uppers, but cheapens things in the back with hard plastic door uppers – I prefer the 2014’s even-handed compromise approach). 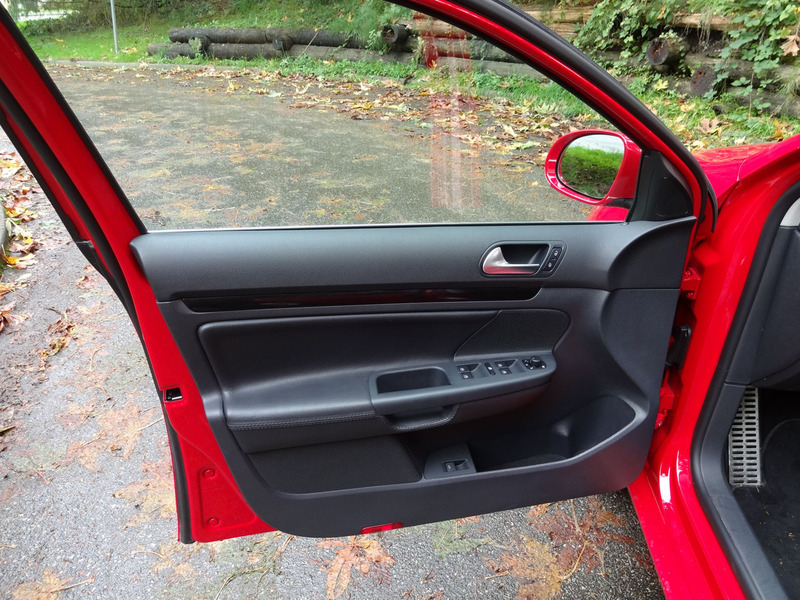 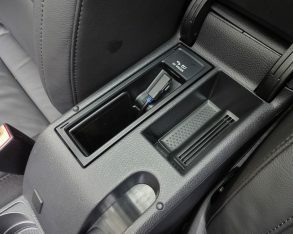 The remainder of the plastics used in the interior is a good-looking and well-assembled blend of matte and textured surfaces, and the switchgear all has a high-end look and feel. 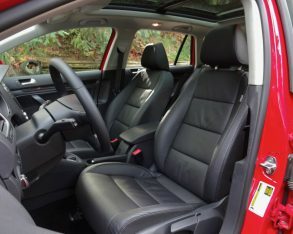 Up front I found the firm, supportive leather-upholstered seats to be a perfect fit for my five-foot-eleven frame, with plenty of available legroom and decent elbowroom. 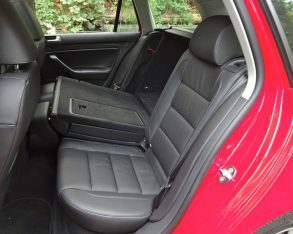 The back seat is a little more compact: I found it to have plenty of headroom and adequate legroom, but because the seat squab is quite low it meant there was no support under the front of my thighs. 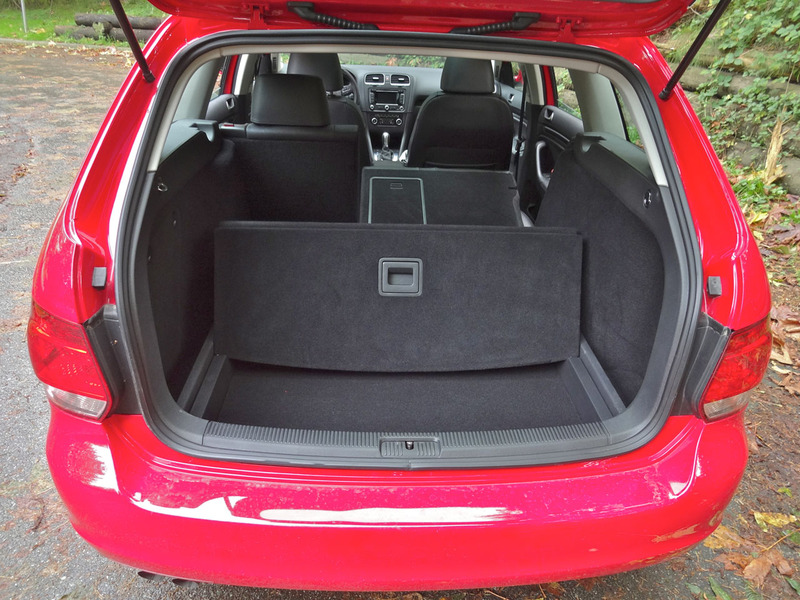 On the bright side, the back seat fits most child seats with relative ease. 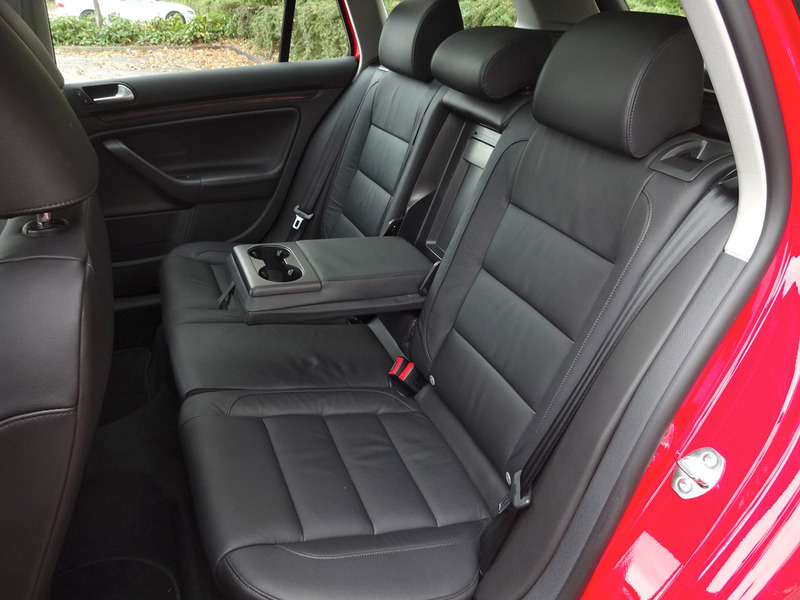 For grown-up backseat passengers there’s a fold-down central armrest with a pair of built-in cupholders. 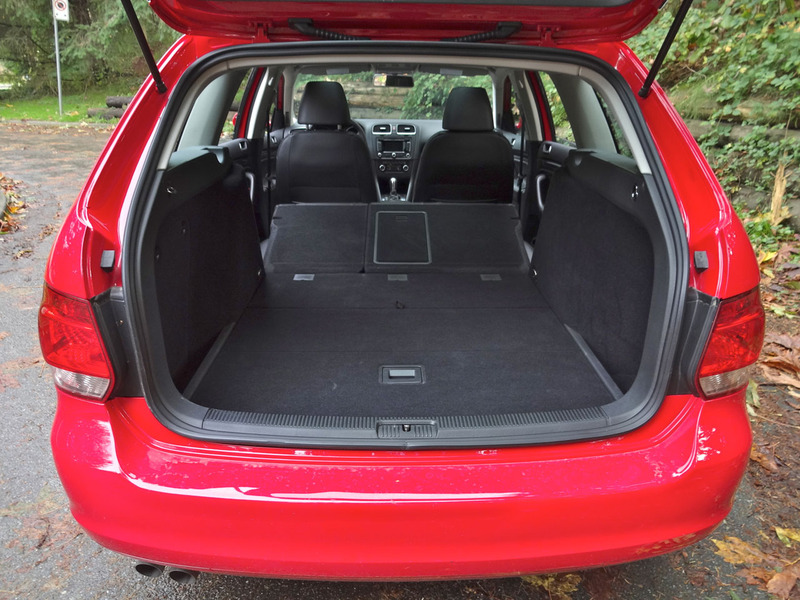 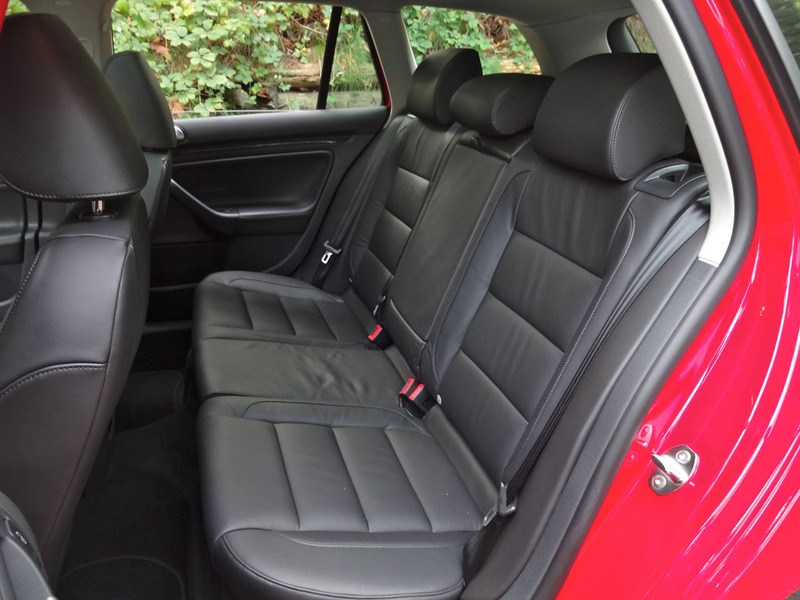 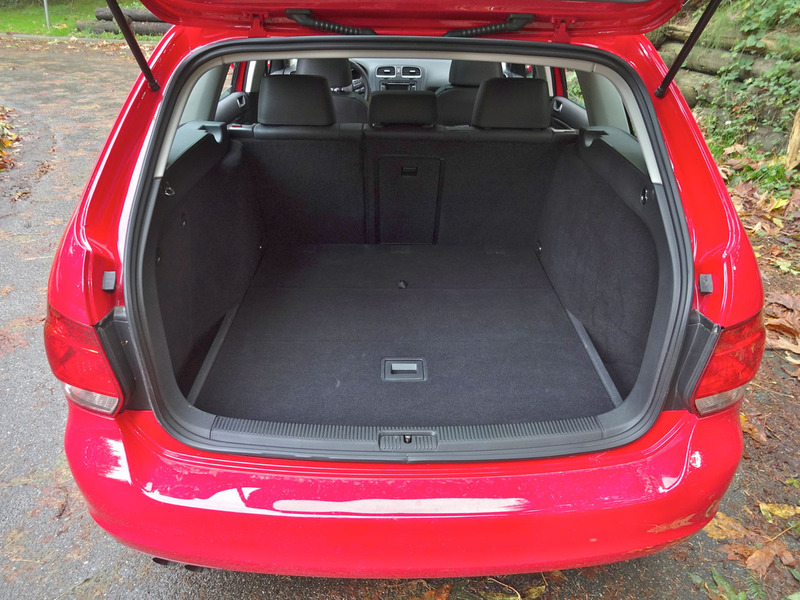 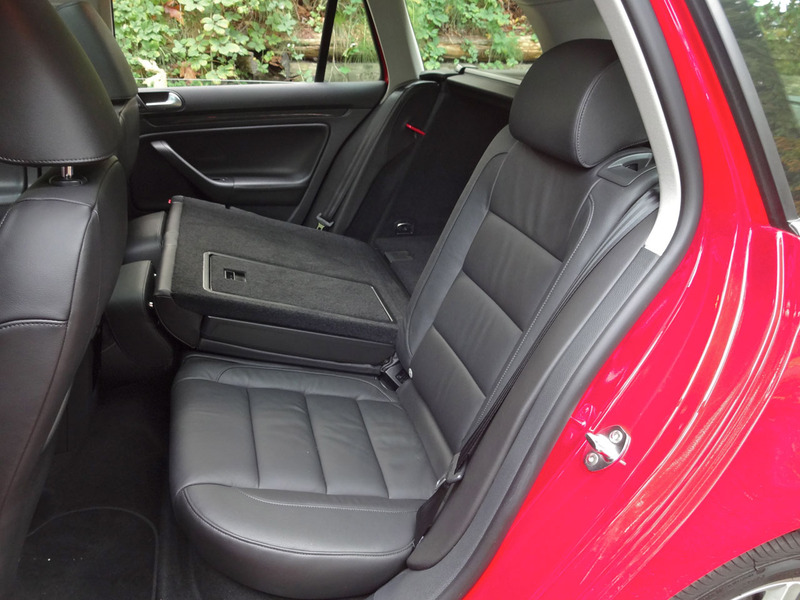 the very back is the Golf Wagon’s interior party-piece, a 930-litre cargo area that can expand to a voluminous 1,890 litres with rear seats folded down. 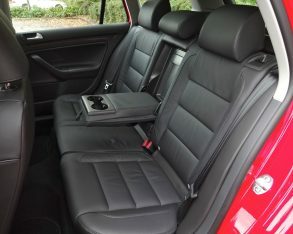 To put this into perspective, the Jeep Cherokee has a lot less cargo space at 1,554 total litres (841 litres with the rear seats up), the Ford Escape just about matches the Golf with 1,920 litres of total space (971 litres behind the second row) and the minivan-like Mazda5 has only marginally more capacity at something like 2,500 litres total cargo space and 1,250 litres with the 3rd-row seats folded (Mazda is a bit cagey about releasing official cargo figures). 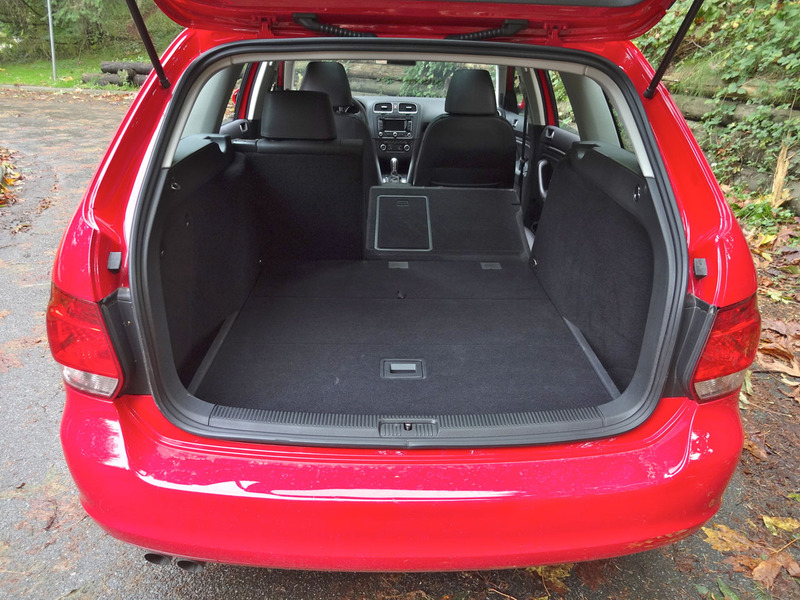 To make the Golf Wagon’s cargo space even more useful there are hidden storage cubbies below the load floor, and an integrated adjustable divider you can use to secure your groceries and prevent them from rolling around during the drive home. 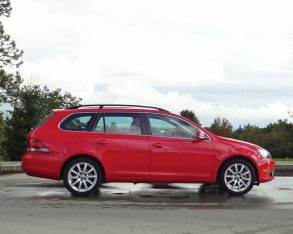 torque to the front wheels or my test car’s 2.0-litre turbocharged diesel engine, which produces 140 horsepower and a healthy 236 lb-ft of torque. 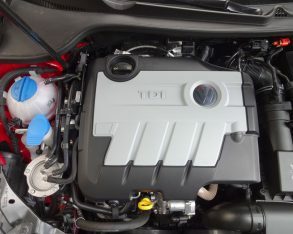 Transmission choices with the gasoline engine include either a five-speed manual transmission or a conventional six-speed automatic for an extra $1,400. 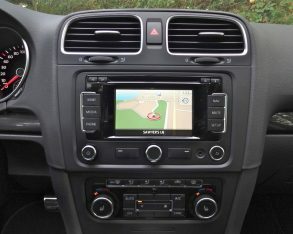 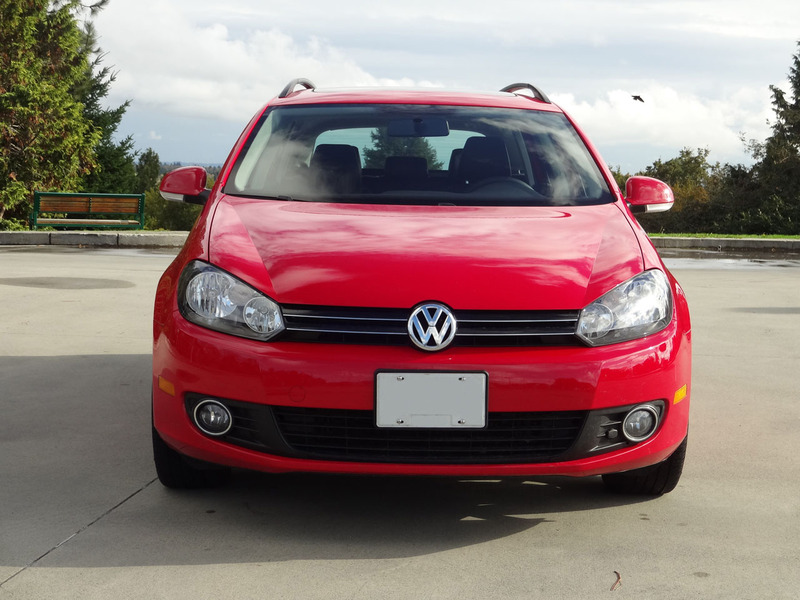 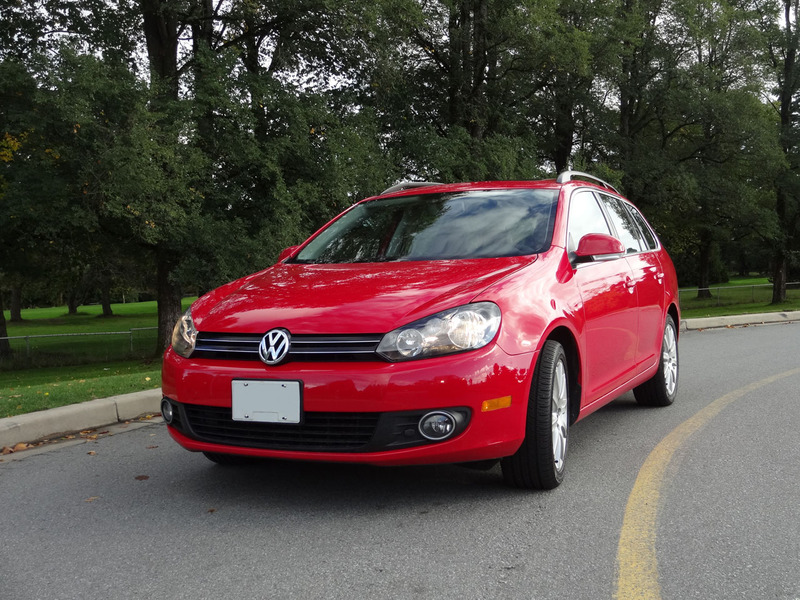 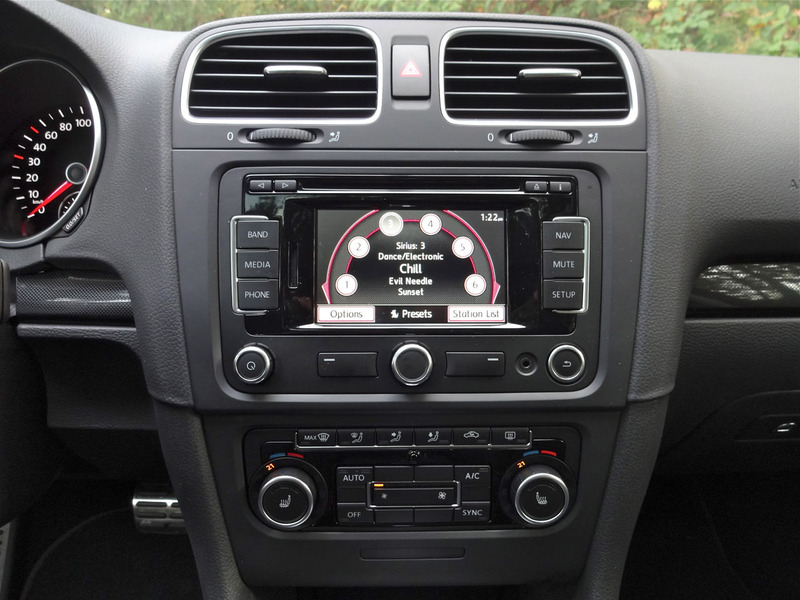 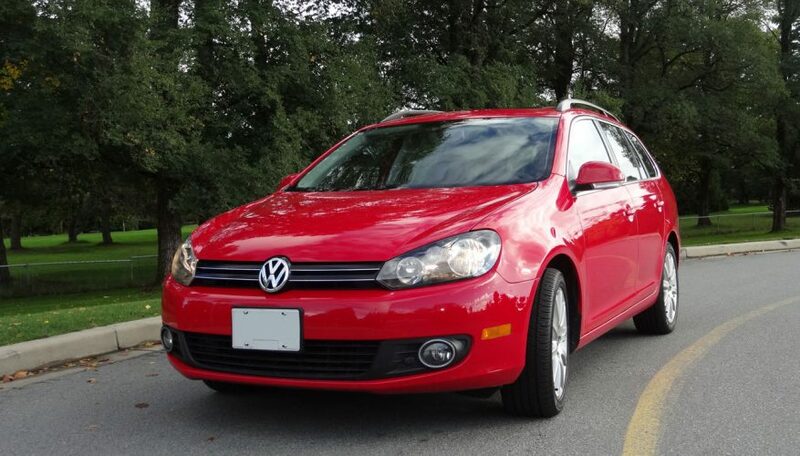 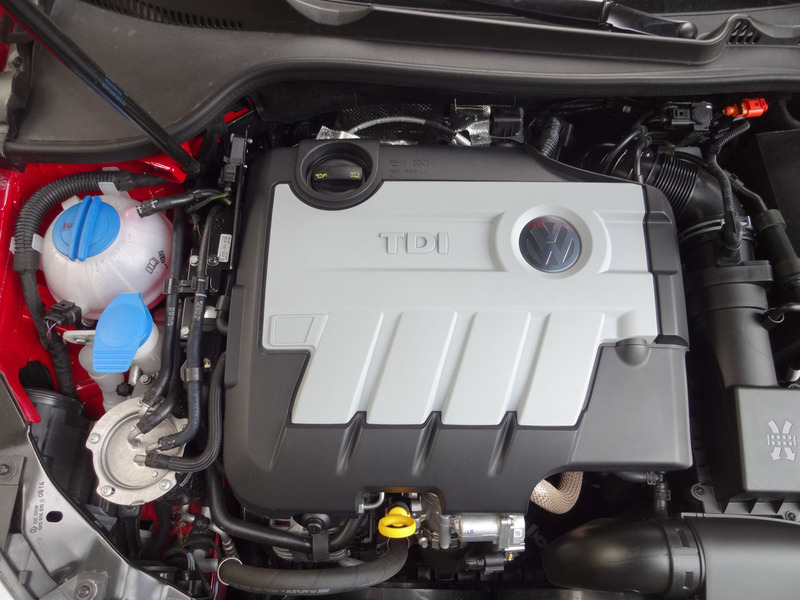 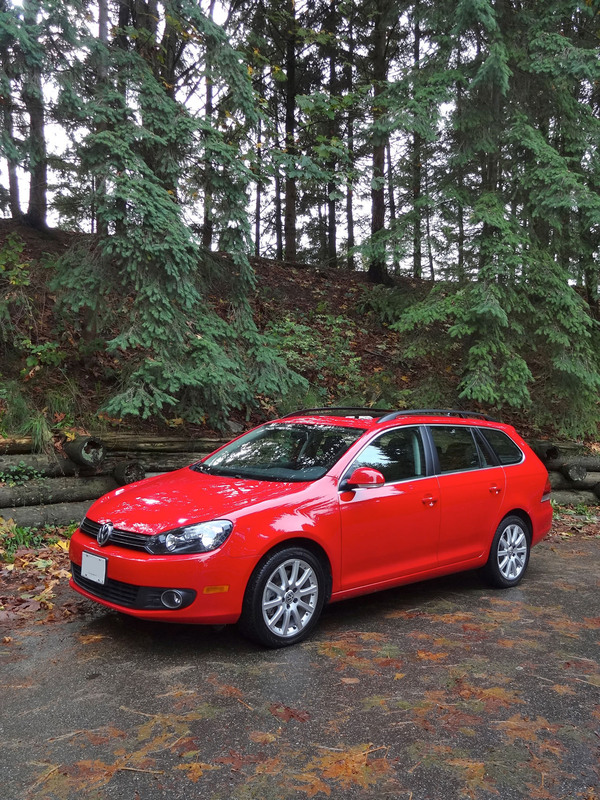 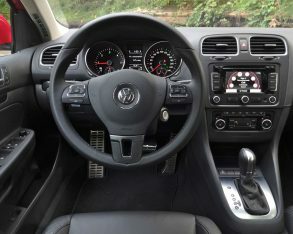 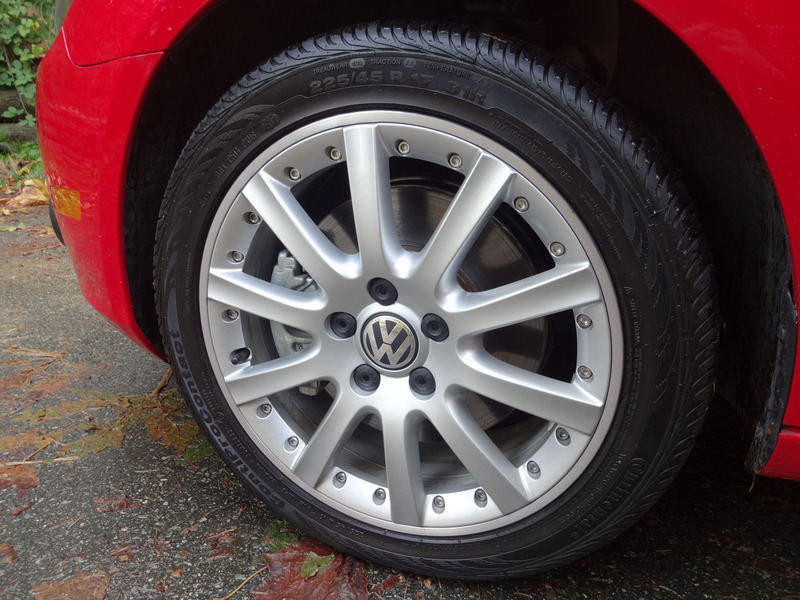 The TDI diesel comes paired with either a six-speed manual or a six-speed DSG automatic (the TDI normally carries a $2,800 price premium but the Wolfsburg Edition whittles this down to $2,300; the DSG automatic adds a further $1,400 to the price). 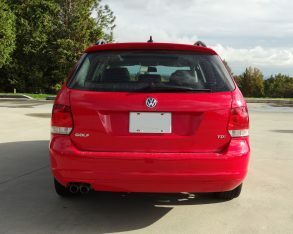 really is quite good. 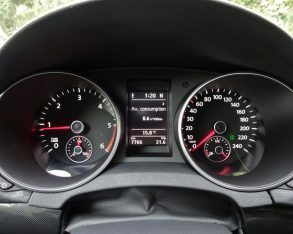 Certainly if you rack up a lot of mileage you can make a strictly-economic argument for the TDI, but it takes a while to see payback: Using the EPA’s five-cycle test, fuel consumption with the diesel works out to 7.8 L/100km city and 5.6 highway, while the gasoline powered car uses 10.2 and 7.1 L/100km under the same test regime. 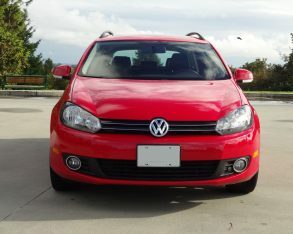 So if you take the average difference and say you’re burning 1.95 litres less fuel per 100km of mixed driving, then at the current near-parity price where I live of about $1.30 per litre for both diesel and gasoline, that means you’d pay off the Wolfsburg Edition TDI’s $2,300 price difference at something like the 90,700 km mark, assuming equal service costs (some owners report slightly higher post-warranty service costs for the diesels, making an extended warranty a tempting proposition; on the other hand the TDIs tend to hold higher resale value). 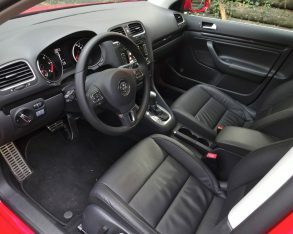 are also the splendid gobs of low-end torque offered up by the diesel, and the more advanced transmissions (the six-speed instead of the five-speed manual or DSG instead of the conventional automatic). 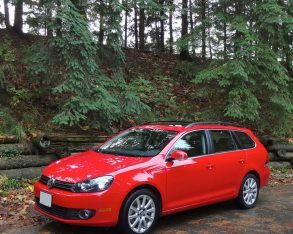 I’ve driven VW’s Golf Wagon TDI with both transmission options and no matter which you choose the engine’s torquey nature not only really suits the car, but makes driving genuinely engaging and enjoyable. 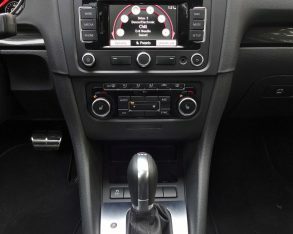 Choose the manual transmission and the diesel’s torque advantage means you can accelerate briskly from traffic lights without incurring a massive fuel economy penalty, and it also means you’re almost never caught in too high a gear, making both city driving and highway passing a snap. 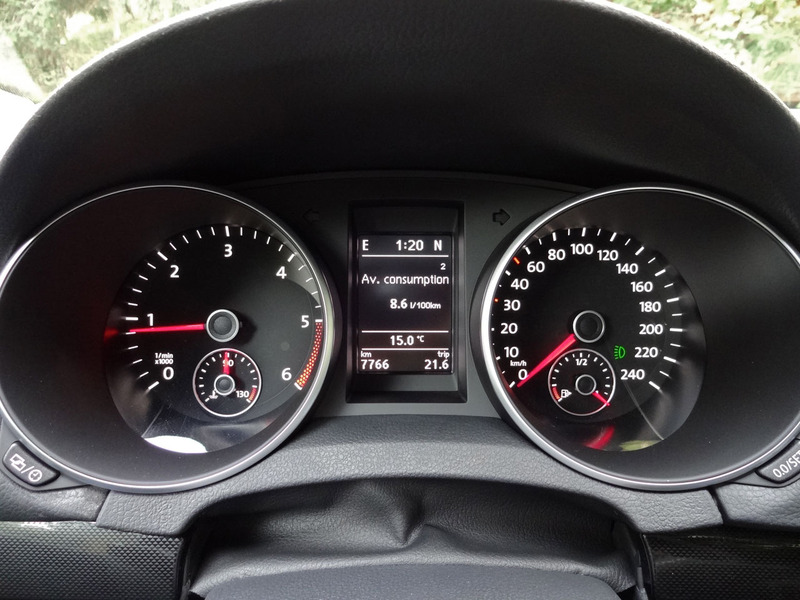 highest available gear in order to get the best possible fuel economy, and when hooked up to the company’s gasoline engines I find this tends to dull engine performance unless you select sport mode. 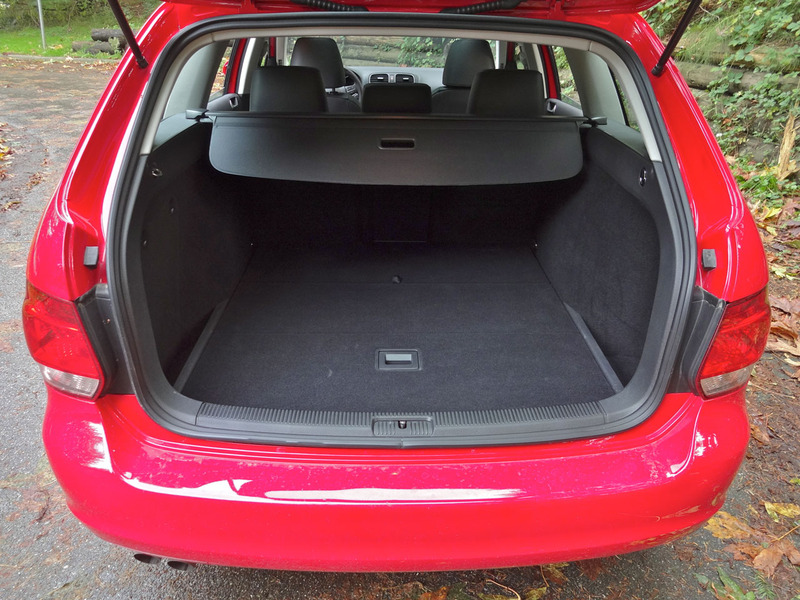 But the TDI diesel pulls so mightily at low revs that no matter how quickly the DSG upshifts there’s plenty of power still available underfoot. 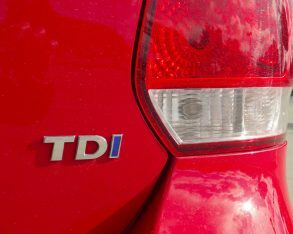 It’s as if DSG stands for "Diesel Synchronized Gearbox" instead of "Direct Shift Gearbox," and while Sport mode is still available the diesel’s torque makes it mostly superfluous. 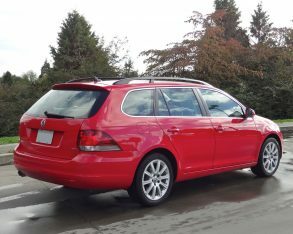 Whichever engine you choose, Volkswagen’s Golf Wagon competes indirectly against a diverse array of rivals, including compact hatchbacks such as the Hyundai Elantra GT and Mazda3 Sport, compact crossovers like the Honda CR-V and Ford Escape, and tall wagons (or is that small minivans?) 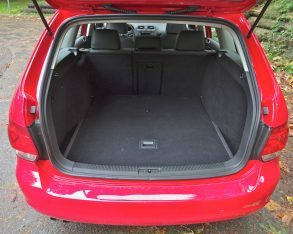 like the Kia Rondo and Mazda5. 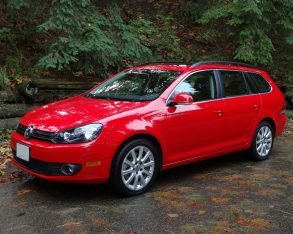 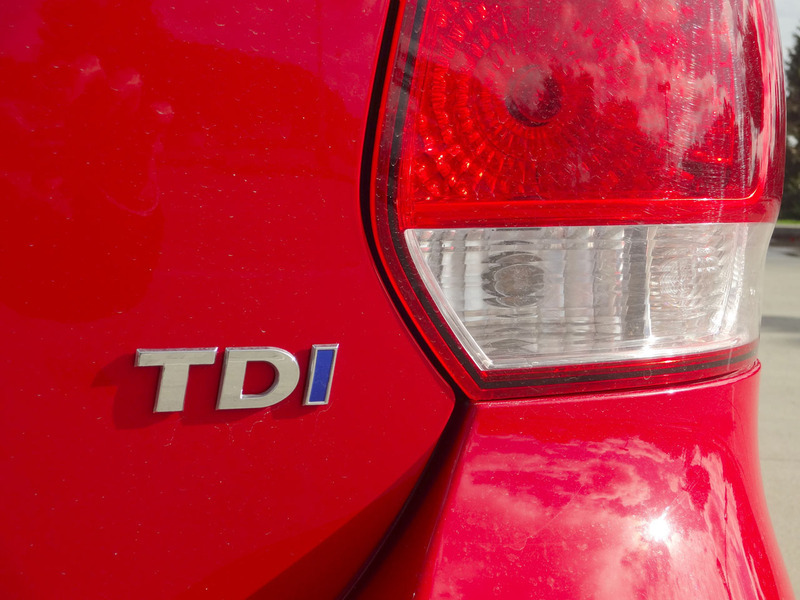 Select the TDI diesel and the Golf Wagon becomes a serious contender against hybrids such as Toyota’s Prius V and Ford’s C-Max. 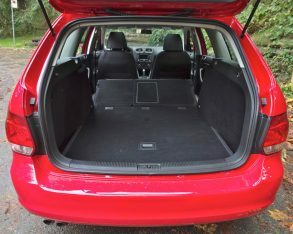 What the Golf Wagon offers that none of its competitors can match is its uniquely well-rounded personality, with hatchback-humbling cargo capacity, crossover-conquering handling, tall wagon-trumping style, and hybrid-humiliating driver engagement. 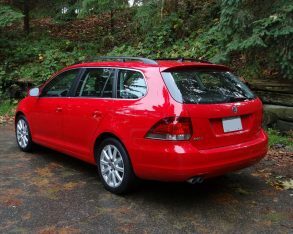 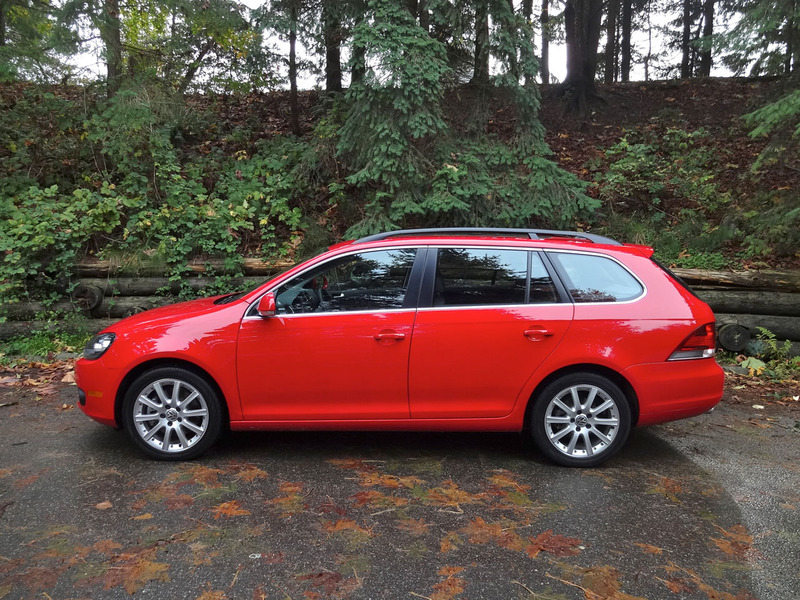 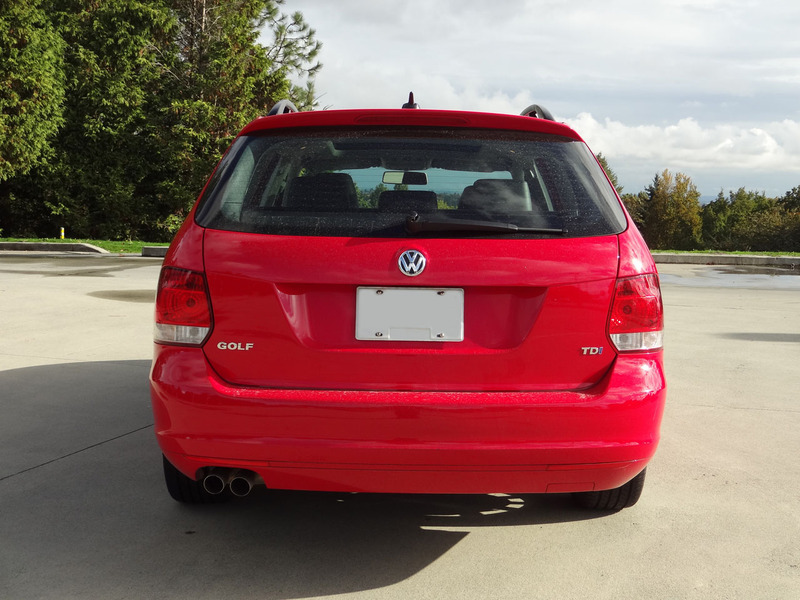 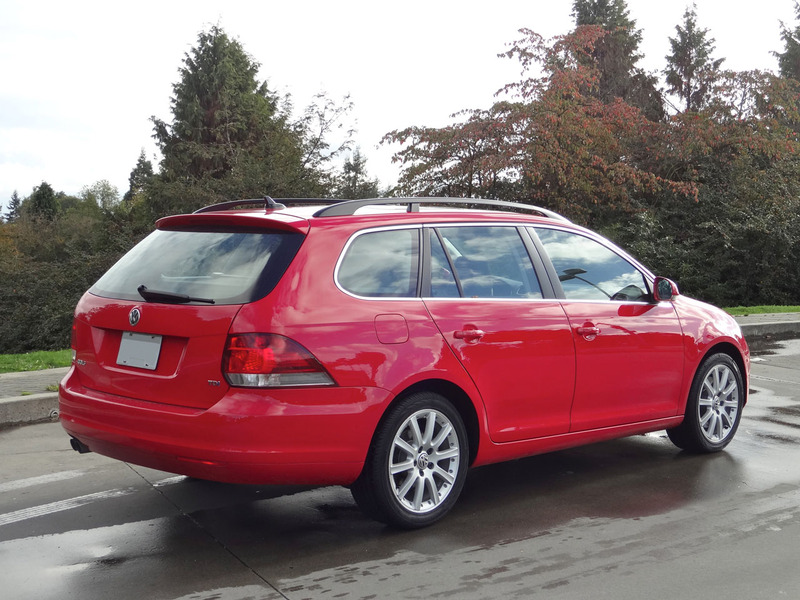 For those who expect their family car to cover all bases the Golf Wagon is tough to beat.